Sidi Sanneh: Conversations with Amadou Samba:"I was never a business partner of Jammeh, I managed him." To many, Amadou Samba is Yaya Jammeh's right hand man and business partner, period. A few have even referred to him as "Jammeh's bag-man" and viewed by many as the sole individual who can lead the transition government to Jammeh's hidden wealth, inside and outside The Gambia. 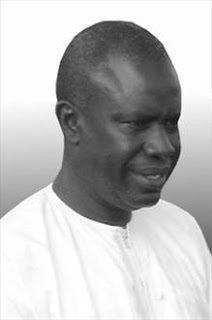 Since we at sidisanneh.blogspot.com have written extensively on matters relating to Jammeh alleged illicit wealth and/or business dealings, Amadou Samba's name has always featured, either as a central player or on the periphery, but always present. So, it was, therefore, surprising when, in reacting to me referring to him as "Jammeh's business partner", he corrected me tersely and swiftly by denying that he was never a business partner of Jammeh. His response was, and I quote "I managed him [referring to Yaya Jammeh], I was never a business partner of Jammeh." He also said something that will take many by surprise and that is, as far as he is aware, all of Jammeh's wealth is in the Gambia and not abroad. Of course, public records in the United States show that the $ 3.5 million Brentcross Road Potomac mansion although sold to the Trustees of the MYJ Family Trust is owned by Yaya Jammeh. Mr. Samba said he fully understands the perception held by many because of his close association with Jammeh which weighed heavily on him. Now, that load has been lifted off of his shoulders, he's ready to make amends so that he can move on with his life. The cryptic nature of the response led me to ask for clarification in a subsequent telephone conversation because as he, himself, has admitted that the public perception is that he is intricately linked with the Jammeh business empire. Was he managing Jammeh, the person or his businesses to which he replied that he was managing Jammeh, the person, because he was unpredictable and erratic as he was impulsive. On the Panama Papers, which was the subject of a couple of blog posts, Mr. Samba admitted that all the companies listed were registered in his holding company's name and stressed the fact that they were companies and not bank accounts. In our coverage of the issue also we cautioned readers that "operating off-shore accounts and/or companies in and of themselves may not be illegal" unless the origin or origins of the funds are derived from illegal activities such as arms trafficking, drugs or other forms of international criminal activities. We have been working on the Panama Papers for several months now with little progress. Offshore financial transactions are difficult to trace and the legal huddles insurmountable even for forensic accountants and international lawyers activities much less a lone blogger with a couple of volunteers who help in research. What investigative reporters working for internationally reputable news agencies and companies have said is that the $ 900,000,000 listed under the three registered companies may represent the total proceeds that passed through those companies, and do not necessarily mean money stashed in some bank fault somewhere. During our third telephone interview, the $ 900,000,000 figure was disputed by Amadou Samba which, according to him, is substantially different from the total turnover of all his companies. He said he doesn't know where the figure came from. Needless to say that the services of competent forensic accountants and lawyers are needed to thoroughly investigate these accounts with a view to confirming or otherwise Mr. Amadou Samba's claims. On the re-establishment of the rule of law: Mr. Amadou Samba has made clear in his letter to Jammeh where his heart is - in The Gambia with his wife, children and grandchildren. "Gambia is my home and I will never live anywhere else", he said to me. He said he will return home once the rule of law is established under the new political order. He believes strongly that under President-elect Adama Barrow, the rule of law will be re-established at which time he will subject himself to any and all legal scrutiny. *We are also in possession of some additional background information about AMASA Holding Company through which Mr. Samba's property development business in the UK was handled until it ceased operation around 2013 when the new offshore tax laws were amended lifting capital gains tax exemption for non-UK residents. In our next installment, we will delve into the Airport, Arch-22 and Farafenni APRC Hospital and the Amadou Samba building (on Pipeline Rd) that collapsed that resulted in loss of lives.